This cozy, 100% cotton blanket celebrates baby's minimalist approach to life. They're so cute, we'll give them a pass on being productive members of society (there's plenty of time for that, anyway). 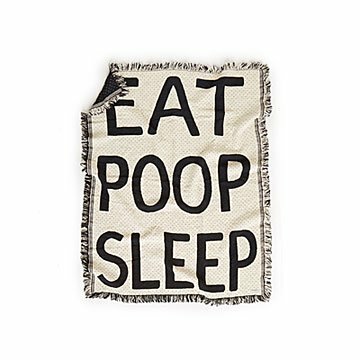 This cozy blanket celebrates baby's minimalist approach to life with Eat, Poop, and Sleep woven in big, bold type. The fun design is just asking for social media pics, and the black and white color palette means it'll go with any nursery decor—where all three of those things may be going on at the same time. Made of 100% cotton in the US. For Kerry Stokes, everything and anything can be a spark of inspiration. But to be clear, it’s her rescue dog, Slug, that gets her most excited to create. As a kid, Kerry remembers the thrill of learning how to sew and picking a craft for each of her birthday parties. When she got older, it wasn’t a surprise she chose to attend the Massachusetts College of Art and Design. There she learned the ins and outs of apparel design, but she soon realized it was home decor that had her heart. After college, she moved to Williamsburg, Brooklyn, and immediately drew inspiration from the bustling, art-centric culture. This made designing easy, and soon she had enough of a following to sell her playful pieces. Today, Kerry lives and works out of her apartment with Slug (napping) by her side. It’s important to her that each blanket or accent pillow has a touch of her personality, which she characterizes as a fun-loving and eclectic with a touch of peacefulness. Cute product. Not for baby but for decoration.